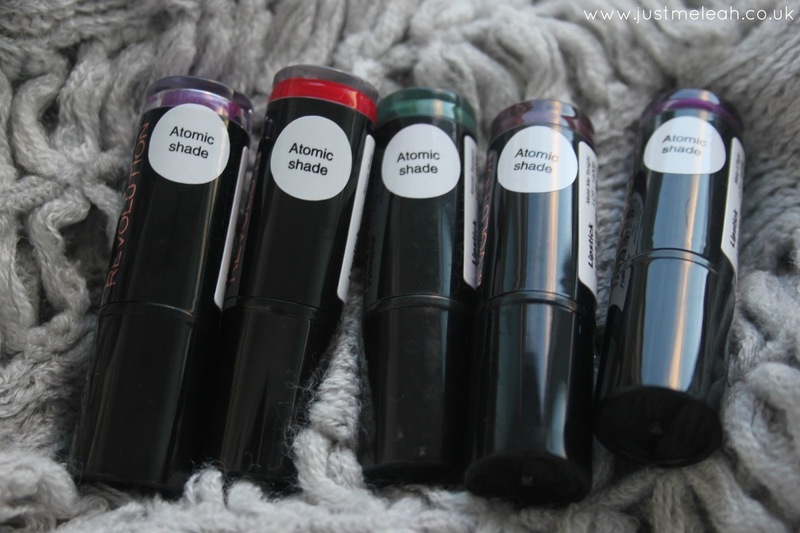 I have swatches of the Makeup Revolution Atomic lipstick collection today. If you've been reading my blog a while you'll know I'm a big Makeup Rev fan, especially of their eyeshadow palettes. 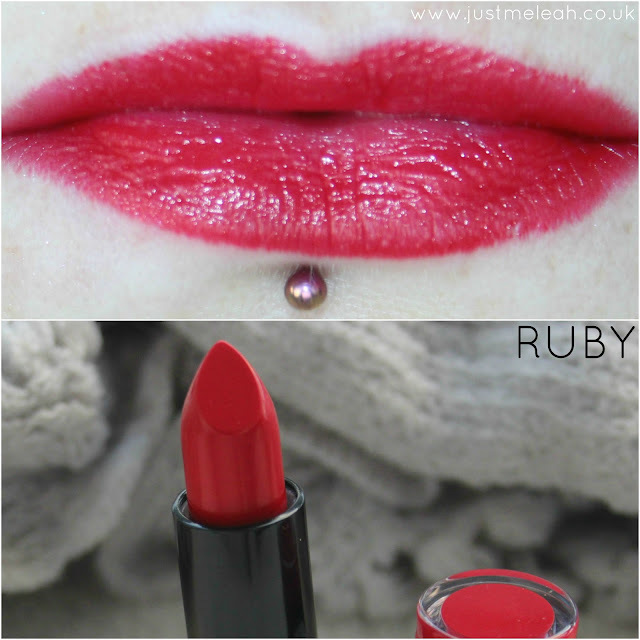 At just £1 each, how do these lipsticks fare? Read on. First of all the packaging of these lipsticks is horrible. I'd happily pay £2 for each lipstick if the packaging was better. The products are fine but they're housed in totally infuriating packaging. A couple of these lipsticks were almost impossible to use - the twisting mechanism is so stiff anyone with arthritis or weak wrists would never be able to use them. I really struggled! Two of them broke off at the base when I lightly swatched them, too. This is the 3rd lipstick in total I've had do this from Makeup Rev. And then there are the lids that come off constantly in my makeup bag as the tube and the lids aren't a close fit. MUA (as far as I'm aware) use the same packaging for their lipsticks and I've never had a problem with those being too stiff to use (although they have the same problem with the loose lids.) Perhaps as the demand for these Makeup Rev products is so high quality control is non existent? Who knows! I now use a layer of washi tape to add a bit more dimension to the cases so the lids fit better. That aside, let's move on to the colour, scent and formulas. All of these lipsticks last 2-3 hours on me, which is average for me as I have a very dry mouth and drink water a lot. 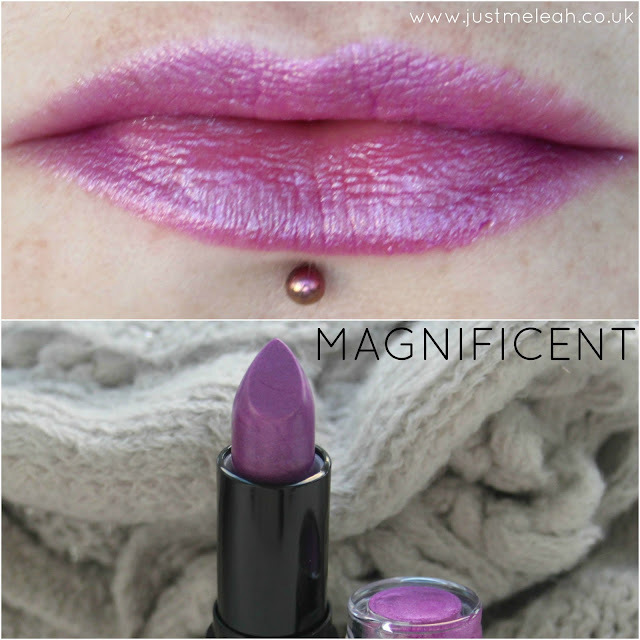 I love Magnificent, and it has a frosted sheen to it which reminds me of 80s lipsticks. It's reasonably moisturising and smells like vanilla. The mechanism in this lipstick is so squeaky and stiff I can barely use it. I'm trying to turn it so hard the plastic is almost breaking. I think I'll decant these lipsticks to a lipstick palette...see more on that at the end of the post! 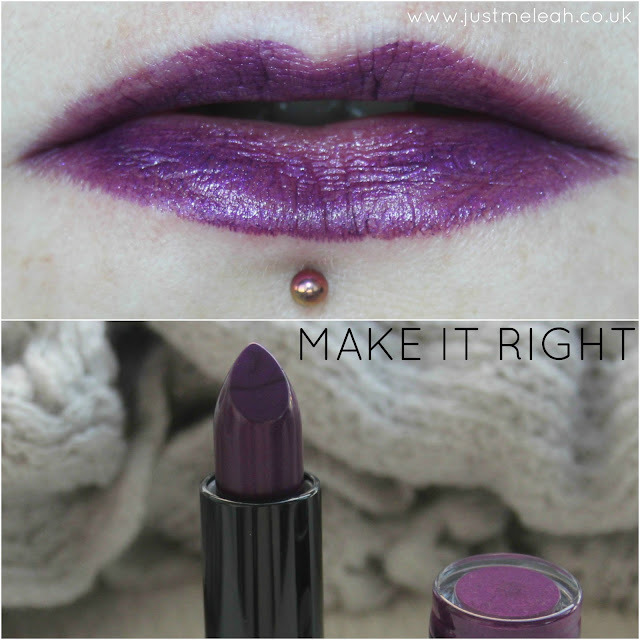 Make it right is a little drying on me, but it's nothing a layer of lip balm before application can't sort. It smells a little bit like a crayon, but I don't mind as this is a relatively unusual colour, and MR do hard to get colours brilliantly. 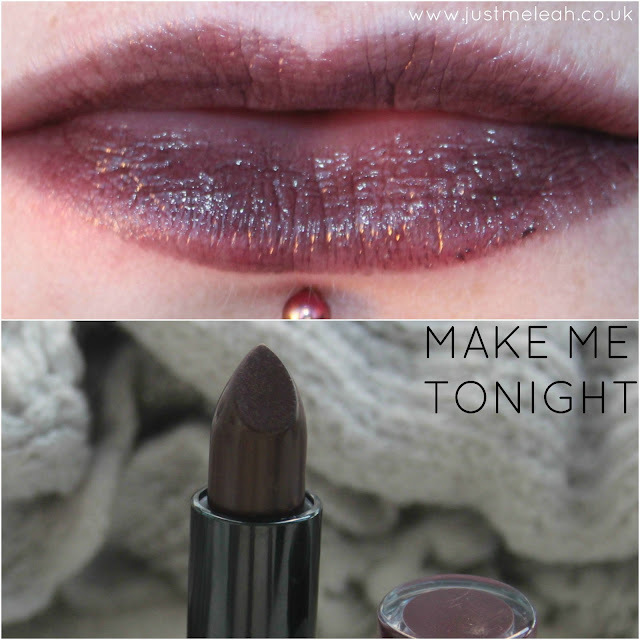 Make me tonight is actually a really unusual dark brown/black colour which veers towards dark berry in certain lights. Shall I call it brerry?! ;) I feel this would look better over a dark lipliner, as this applies quite thinly, but I look forward to having a play with this. It smells strongly of crayon but I don't mind again as the colour is unusual. I find it quite moisturising. Ruby is a stonker of a colour - I love it! The formula is lovely and smooth, there's no drag and it smells of vanilla. The mechanism is stiff on this one too. This one feels moisturising too. Serpent is just a fantastic colour, isn't it? As soon as I saw this lipstick for sale I was ecstatic. Far from being a woman who shies away from colour as she ages, I'm embracing my eccentricity early! You can see in the photo below the lid came off and got mushed up. 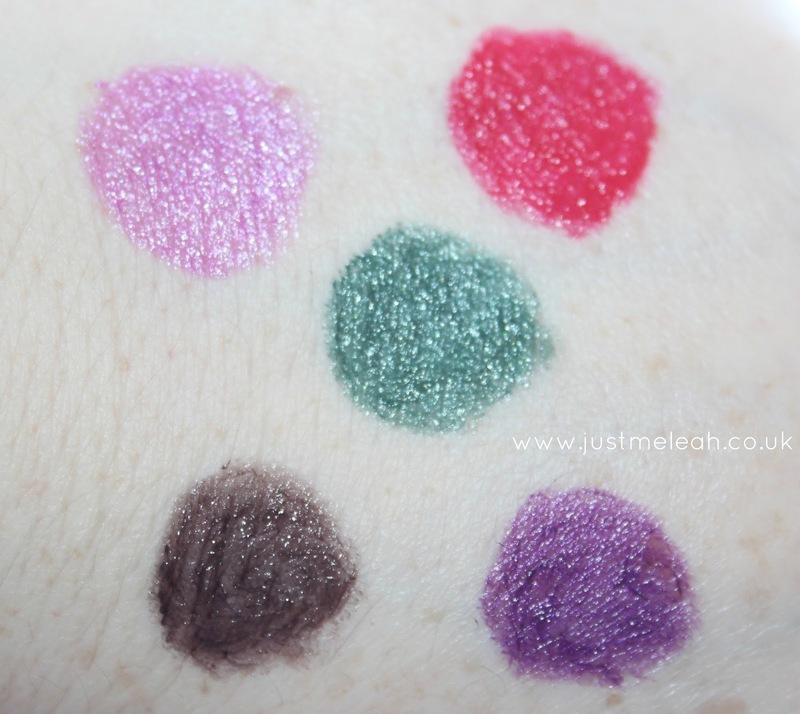 The colour is a bit patchy and next time I wear it I will load up with green eyeshadow over the top to give it some depth, or maybe even apply it over black lipstick. This is a tiny bit drying too. Bottom line: For a pound, I can put up with slight drying from some of the shades, as lip balm beforehand is no biggie. I can put up with a crayon smell. Hell, I can even put up with poorly formulated lipsticks that break off at the base and then lay at an angle, because I can always use a lip brush and scoop the goo off the inside of the tube. But I'm really no fan of tubes that are barely usuable. This a varied little collection and at the price, these colours are phenomenal. Ruby is my favourite, closely followed by Serpent. 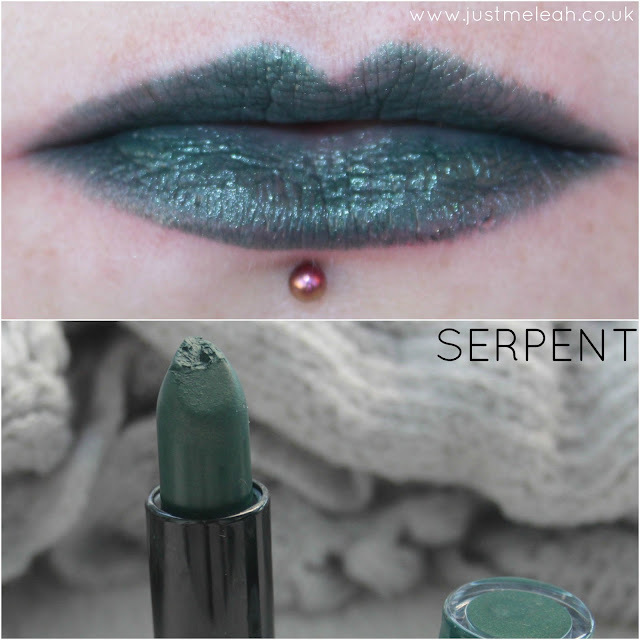 I do recommend you buy these lipsticks if you love unusual colours as much as me. As I said at the start of the post, I wish the packaging were better......and that there was a Makeup Revolution stand at my local Superdrug! Then I'd be able to test the tubes to make sure they're not jammed. Have you tried any of these lipsticks? If so, what did you think? Have you had any problems with Makeup Revolution lipsticks? You can buy Makeup Revolution on their website, in select Superdrug stores and on Superdrug.com. 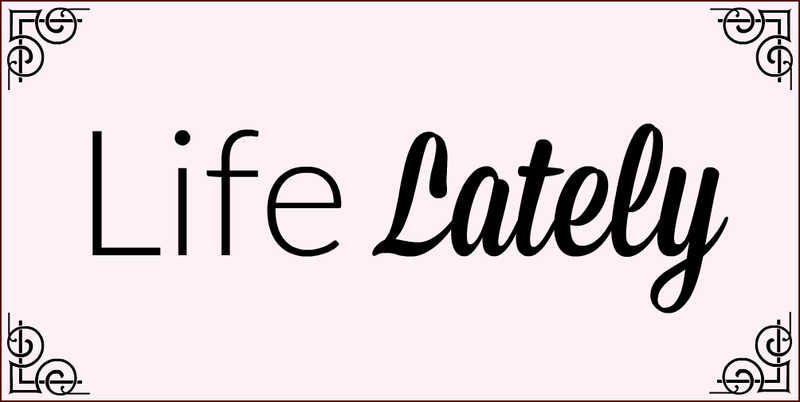 The newest lines launch on their website before Superdrug.